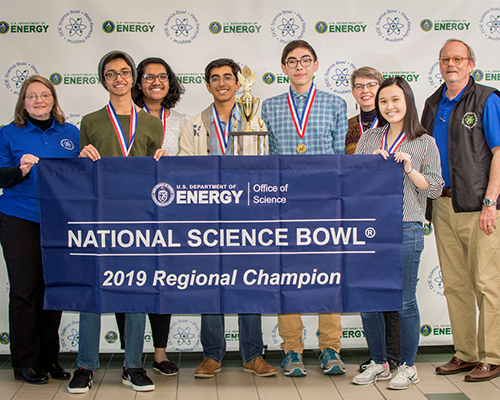 A team from The Gatton Academy won the U.S. Department of Energy's (DOE) West Kentucky Regional Science Bowl on February 1. The DOE National Science Bowl® challenges students’ knowledge in all areas of science, including biology, chemistry, Earth science, physics, energy, and math. This is the fifth consecutive year The Gatton Academy has become the West Kentucky Regional Science Bowl champion and advanced to the national tournament. With the win, the team will now travel to the DOE’s National Science Bowl, held in Washington, DC from April 25-29. The DOE provides all-expense paid travel for the winning team to represent west Kentucky in the national competition. The Gatton Academy’s winning team consists of senior Anas Gondal (Danville High School), senior Rithwik Ghanta (Randall K. Cooper High School), junior Ngoc Nguyen (South Warren High School), junior Hasitha Ramisetti (Western Hills High School), and junior David Suarez (Southwestern High School). Nineteen high school teams competed in the day-long regional tournament. During the national competition, The Gatton Academy will compete in the same fast-paced, question-and-answer format that was used in the regional competition. The students will not be answering questions during the entire trip, as they will also have the opportunity to visit national monuments and museums. Over 9,000 high school students nationwide compete at the regional level. Approximately 65 high school teams, or about 325 high school students in total, proceed to Washington, DC for the National Science Bowl. About The Gatton Academy: Established in 2007, The Gatton Academy is Kentucky’s first two-year residential STEM program for gifted and talented junior and seniors. The Gatton Academy’s students enroll as juniors and are full-time WKU students while pursuing their interests in advanced science, technology, engineering and mathematical careers. The Gatton Academy has been named to The Washington Post’s list of top-performing schools with elite students for nine consecutive years.